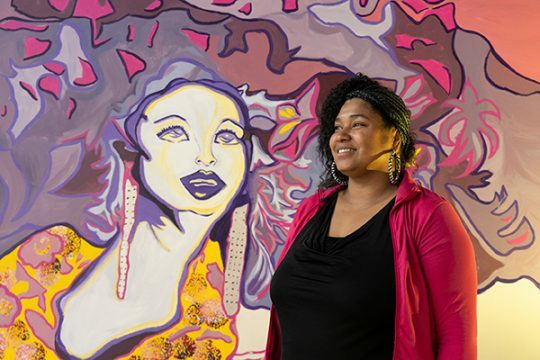 AURORA | Jiacuy Roche said she heard nothing but praise from people passing by while she made finishing touches on “Afro-Flower Lady,” her debut mural at the Stanley Marketplace, last month. It will accompany an exhibition featuring her other art and Brazillian dance later in April. Roche, who was born in Brazil and adopted to white parents in the U.S., said she grew up knowing a lot about her diverse South American culture and how being of African descent was an important piece to that. Her parents didn’t change her name, “they really embraced my background,” she said. Her roots have been a big influence on her own art. Her pieces are filled with bright colors and scenes from her native Brazil. “Afro-Flower Lady,” which was transformed into a mural from a mixed-media piece, isn’t necessarily a nod to Latin culture, Roche admitted, but it does include elements from what she often includes in her other work. “Afro-Flower Lady” is, in one word, bold. The woman exudes confidence and calmness. Roche said that’s something that always seems to catch people’s attention. They often describe it as “stunning,” she said. The mural, near the Create cooking school on the first floor, is Roche’s first. It took her three days and a little bit of self-trust to complete, she said. She started with a projector and then did a little improvising when she got to painting the woman’s hair. After completing the piece, Roche said somebody had told her a little girl stopped and stared at the mural, exclaiming that she looked like the woman on the wall. They both had afro hairstyles. Roche has been a professional artist for nearly all of her career. She has a degree in human services, with an emphasis in fine art. She helped develop a former art program for Goodwill and taught art at the former Excelsior Youth Center. Now she works in the Cherry Creek School District as a paraprofessional. All of that work taught Roche that art can be therapeutic and create instant connections between different cultures and lifestyles, she said. “Afro-Flower Lady” has been no different. The mural and Brazilan fusion art and dance event slated for the Stanley Marketplace on April 13 is right at home in Aurora, where nearly 20 percent of the city’s residents are foreign born. A changing identity in north Aurora, where there is plenty of redevelopment makes the showcase even more relevant. Ally Fredeen, general manager of the Stanley Marketplace, agreed. She worked with Roche to develop the show and idea. “It’s ingrained in our DNA,” Fredeen said of including diverse cultures and people around the marketplace. Even more, Roche said, there’s a lot for people to learn about how people of African descent contributed to the culture of Brazil. Like with the African roots of Samba dancing or feijoada —Brazil’s national dish which some say was first made by African slaves. She said she hopes the Brazilian fusion event can enlighten people that way.